For others persons, see Gerrit Smith (disambiguation). Gerrit Smith (March 6, 1797 – December 28, 1874) was a leading United States social reformer, abolitionist, politician, and philanthropist. Spouse to Ann Carroll Fitzhugh, Smith was a candidate for President of the United States in 1848, 1856, and 1860, but only served 18 months in the federal government—in Congress as a Free Soil Party Representative, in 1853–4. Smith, a significant financial contributor to the Liberty Party and the Republican Party throughout his life, spent much time and money working towards social progress in the nineteenth-century United States. Besides making substantial donations of both land and money to create an African-American community in North Elba, New York, he was involved in the temperance movement and, later in life, the colonization movement. A staunch abolitionist, he was a member of the Secret Six who financially supported John Brown's raid at Harpers Ferry, West Virginia. Brown's farm, in North Elba, was on land he bought from Smith. Smith was born in Utica, New York to Peter Gerrit Smith (1768–1837) and Elizabeth (Livingston) Smith (1773–1818), daughter of Col. James Livingston (1747–1832) and Elizabeth (Simpson) Livingston (1750–1800). Smith's maternal aunt, Margaret Livingston, was married to Judge Daniel Cady (1773–1859). Their daughter Elizabeth Cady Stanton, a founder and leader of the women's suffrage movement, was Smith's first cousin. Elizabeth Cady met her future husband, Henry Stanton, also an active abolitionist, at the Smith family home in Peterboro, New York. Established in 1795, the town had been founded by and named for Gerrit Smith's father, Peter Smith, who built the family homestead there in 1804. Gerrit Smith graduated from Hamilton College in 1818. In January 1819, he married Wealtha Ann Backus (1800–1819), daughter of Hamilton College's first President, Azel Backus D.D. (1765–1817), and sister of Frederick F. Backus (1794–1858). Wealtha died in August of the same year. Returning home from college, Smith took on the management of the vast estate of his father, a long-standing partner of John Jacob Astor, and greatly increased the family fortune. In 1822, he married Ann Carroll Fitzhugh (1805–1879), sister of Henry Fitzhugh (1801–1866). They had two children: Elizabeth Smith Miller (1822–1911) and Greene Smith (ca. 1841–1880). About 1828 Smith became an active temperance campaigner, and in his hometown of Peterboro, he built one of the first temperance hotels in the country. He became an abolitionist in 1835, after attending an anti-slavery meeting in Utica, which had been broken up by a mob. In 1840, Smith played a leading part in the organization of the Liberty Party. In the same year, their presidential candidate James G. Birney married Elizabeth Potts Fitzhugh, Smith's sister-in-law. Smith and Birney travelled to London that year to attend the World Anti-Slavery Convention in London. Birney, but not Smith, are recorded in the commemorative painting of the event. In 1848, Smith was nominated for the Presidency by the remnant of this organization that had not been absorbed by the Free Soil Party. An "Industrial Congress" at Philadelphia also nominated him for the presidency in 1848, and the "Land Reformers" in 1856. In 1840 and again in 1858, he ran for Governor of New York on an anti-slavery platform. Smith made woman suffrage a plank in the Liberty Party platform on June 14–15, 1848. On June 2, 1848, in Rochester, New York, Smith was nominated as the Liberty Party's presidential candidate. At the National Liberty Convention, held June 14–15 in Buffalo, New York, Smith gave a major address, including in his speech a demand for "universal suffrage in its broadest sense, females as well as males being entitled to vote." The delegates approved a passage in their address to the people of the United States addressing votes for women: "Neither here, nor in any other part of the world, is the right of suffrage allowed to extend beyond one of the sexes. This universal exclusion of woman... argues, conclusively, that, not as yet, is there one nation so far emerged from barbarism, and so far practically Christian, as to permit woman to rise up to the one level of the human family." Reverend Charles C. Foote was nominated as his running mate. The ticket would come in fourth place in the election, carrying 2,545 popular votes, all from New York. By 1856, very little of the Liberty Party remained after most of its members joined the Free Soil Party in 1848 and nearly of all what remained of the party joined the Republicans in 1854. The small remnant of the party renominated Smith under the name of the "National Liberty Party". In 1860, the remnant of the party was also called the Radical Abolitionists. A convention of one hundred delegates was held in Convention Hall, Syracuse, New York, on August 29, 1860. Delegates were in attendance from New York, Pennsylvania, New Jersey, Michigan, Illinois, Ohio, Kentucky, and Massachusetts. Several of the delegates were women. Smith, despite his poor health, fought William Goodell in regard to the nomination for the presidency. In the end, Smith was nominated for president and Samuel McFarland from Pennsylvania was nominated for vice president. The ticket won 171 popular votes from Illinois and Ohio. In Ohio, a slate of presidential electors pledged to Smith ran with the name of the Union Party. Smith, along with his friend and ally Lysander Spooner, was a leading advocate of the United States Constitution as an antislavery document, as opposed to abolitionist William Lloyd Garrison, who believed it was to be condemned as a pro-slavery document. In 1852, Smith was elected to the United States House of Representatives as a Free-Soiler. In his address, he declared that all men have an equal right to the soil; that wars are brutal and unnecessary; that slavery could be sanctioned by no constitution, state or federal; that free trade is essential to human brotherhood; that women should have full political rights; that the Federal government and the states should prohibit the liquor traffic within their respective jurisdictions; and that government officers, so far as practicable, should be elected by direct vote of the people. Unhappy with his separation from his home and business, Smith resigned his seat at the end of the first session, ostensibly to allow voters sufficient time to select his successor. After becoming an opponent of land monopoly, he gave numerous farms of 50 acres (200,000 m²) each to indigent families. In 1846, hoping to help black families become self-sufficient, to isolate and thus protect them from escaped slave-hunters, and to provide them with the property ownership that African Americans needed to vote in New York, Smith attempted to colonize approximately 120,000 acres (490 km2) of land in remote North Elba, New York (near Lake Placid) with free blacks. Abolitionist John Brown joined his project, purchasing land and moving his family there. The difficulty of farming in the Adirondack region, coupled with the settlers' lack of experience in housebuilding and the bigotry of white neighbors, caused the "Timbuctoo" experiment to fail. Peterboro became a station on the Underground Railroad. Due to his connections with it, Smith financially supported a planned mass slave escape in Washington, DC in April 1848, organized by William L. Chaplin, another abolitionist, as well as numerous members of the city's large free black community. The Pearl incident attracted widespread national attention after the 77 slaves were intercepted and captured about two days after they sailed from the capital. After 1850, Smith furnished money for the legal expenses of persons charged with infractions of the Fugitive Slave Law. 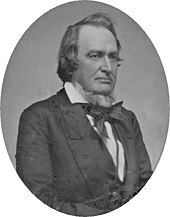 Smith became a leading figure in the Kansas Aid Movement, a campaign to raise money and show solidarity with anti-slavery immigrants to that territory. It was during this movement that he first met and financially supported John Brown. He later became more closely acquainted with Brown, to whom he sold a farm in North Elba, and from time to time supplied him with funds. In 1859, Smith joined the Secret Six, a group of influential northern abolitionists, who supported Brown in his efforts to capture the armory at Harpers Ferry, West Virginia (then Virginia) and arm the slaves. After the failed raid on Harpers Ferry, Senator Jefferson Davis unsuccessfully attempted to have Smith accused, tried, and hanged along with Brown. Upset by the raid, its outcome, and its aftermath, Smith suffered a mental breakdown, and for several weeks was confined to the state asylum in Utica. When the Chicago Tribune later claimed Smith had full knowledge of Brown's plan at Harper's Ferry, Smith sued the paper for libel, claiming that he lacked any such knowledge and thought only that Brown wanted guns so that slaves who ran away to join him might defend themselves against attackers. Smith's claim was countered by the Tribune, which produced an affidavit, signed by Brown's son, swearing that Smith had full knowledge of all the particulars of the plan, including the plan to instigate a slave uprising. In writing later of these events, Smith said, "That affair excited and shocked me, and a few weeks after I was taken to a lunatic asylum. From that day to this I have had but a hazy view of dear John Brown's great work. Indeed, some of my impressions of it have, as others have told me, been quite erroneous and even wild." Smith was a major benefactor of New-York Central College, McGrawville, a co-educational and racially integrated college in Cortland County. Smith was in favor of the Civil War, but at its close he advocated a mild policy toward the late Confederate states, declaring that part of the guilt of slavery lay upon the North. In 1867, Smith, together with Horace Greeley and Cornelius Vanderbilt, helped to underwrite the $100,000 bond needed to free Jefferson Davis, who had, at that time, been imprisoned for nearly two years without being charged with any crime. In doing this, Smith incurred the resentment of Northern Radical Republican leaders. Smith's passions extended to religion as well as politics. Believing that sectarianism was sinful, he separated from the Presbyterian Church in 1843. He was one of the founders of the Church at Peterboro, a non-sectarian institution open to all Christians of whatever denomination. His private benefactions were substantial; of his gifts he kept no record, but their value is said to have exceeded $8,000,000. Though a man of great wealth, his life was one of marked simplicity. He died in 1874 while visiting relatives in New York City. The Gerrit Smith Estate, in Peterboro, New York, was declared a National Historic Landmark in 2001. ^ a b c Wellman, 2004, p. 176. ^ "RADICAL ABOLITION NATIONAL CONVENTION". Douglass' Monthly. October 1860. p. 352. ^ "US President - Liberty (Union) National Convention". Our Campaigns. November 24, 2008. ^ "Resignation of Gerrit Smith," New York Daily Times, vol. 3, whole no. 868 (June 29, 1854), pg. 1. ^ "Gerrit Smith Estate". National Historic Landmark summary listing. National Park Service. 2008-01-17. Archived from the original on 2012-10-09. This article incorporates text from a publication now in the public domain: Chisholm, Hugh, ed. (1911). "Smith, Gerrit" . Encyclopædia Britannica. 25 (11th ed.). Cambridge University Press. pp. 261–262. Frothingham, O. B., Gerrit Smith: a Biography (New York, 879). ISBN 0-7812-2907-3. United States Congress. "Gerrit Smith (id: S000542)". Biographical Directory of the United States Congress. Wikimedia Commons has media related to Gerrit Smith.